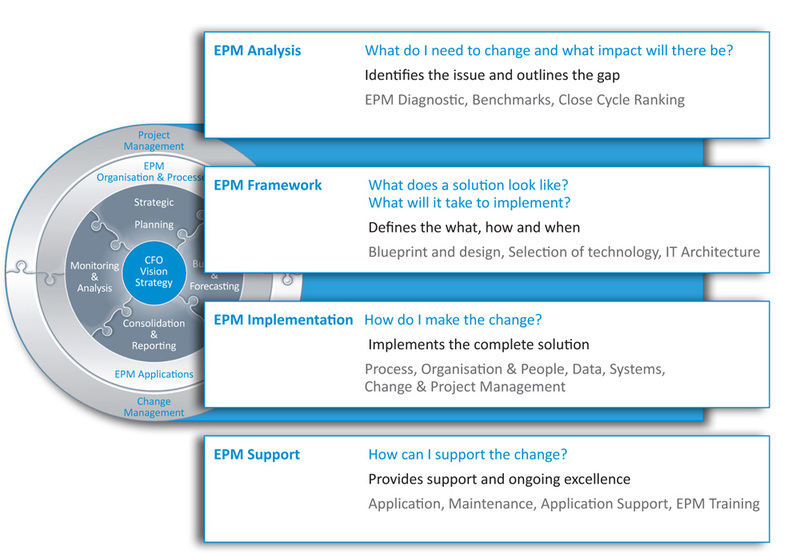 EPM International is a leading provider of full life cycle services for Enterprise Performance Management (EPM). Our services range from defining leading edge performance management processes and an associated performance management roadmap through to project management, implementation and application management services. The depth and focus of our EPM application skills are unparalleled and enable us to command a leading presence within the EPM sector. These EPM application skills are supplemented with finance, information technology, business and process skills. It is this holistic skill set with our passion for excellence, dedication and focus to our client’s situation which truly creates sustainable value. If you work with EPM International members you get full access to the resources and expertise of your local EPM International member but supplemented by the additional expertise, competence and deep collective EPM research, knowledge and technical skills of all EPM International members. This gives you access to the largest specialist EPM network in the world. We help our clients transform their finance function and supporting financial systems around the EPM agenda. We implement high performance and reliable consolidation, reporting, planning, budgeting, forecasting, sales & operational planning and analytical solutions with a particular focus on the leading EPM suites. We have specific strengths across EPM International in tailored solutions for insurance companies and banks including. We help our clients design EPM processes (e.g. fast close, better budgeting, integrated planning, balanced scorecard(s), perform system selection and define and realise their EPM transformation roadmaps. We ensure our clients gain long term value and leverage from their EPM investments by providing cost effective EPM Application Management, training and extended support services. We build on the experience and expertise of 500 experts in 12 countries. Many of us share a common PwC heritage, we are all passionate about helping our clients improve EPM processes and systems.